Considering just how delicious Thai food is, there aren’t that many Thai restaurants in North Herts. We’re still mourning the unexpected closure of Thai Garden in Letchworth. 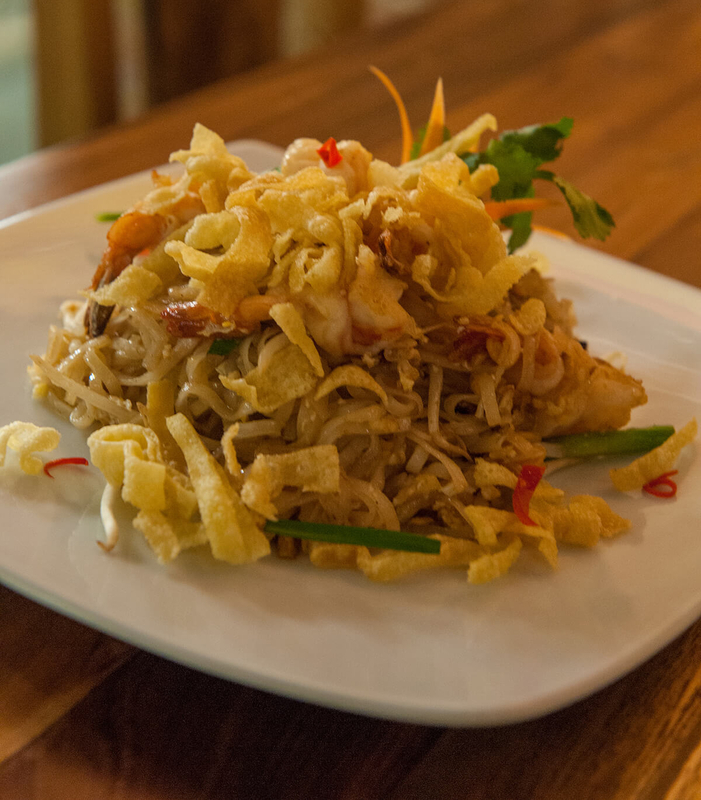 Sukawatee in Hitchin is now our go-to Thai and a firm favourite. A friend recently introduced me to Sala Thong in Stevenage Old Town, which opened in March this year following the success of its first restaurant in Cambridge, and it gets a big Mums Off Duty thumbs up. The popularity of Sala Thong means you need to be organised and book plenty in advance but it’s easy to reserve a table on their website. You can generally find a place to park on the High Street, or in the big car park on Primett Road. The food is very tasty. Crackers are provided to munch on while you ponder the menu, and there is a wide choice of mains including fish, curries, stir fries, veggie options and noodles galore, with plenty of sides to add variety. The house wine was perfectly acceptable. Our drink order arrived promptly, as did our food, despite the restaurant being chocka. Don’t expect to be able to linger at your table for more than a couple of hours though, as you will be (politely) requested to vacate for the next lot of noodle-hungry guests. Sala Thong is reasonably priced, maybe a touch more expensive than some, however the food is worth it. Overall, this new restaurant lives up to its impressive reputation, and we’ll definitely be returning. If you’ve been to Sala Thong, please let us know if you enjoyed it in the comments below. Three of us went to the restaurant yesterday for dinner. Food was very good but disappointingly my food arrived 22 minutes before the other two had their plate on the table which meant that my food had gone cold by then. And there was no apology! Yes, the food is very tasty! That’s a shame about the delay in the food arriving. We had good service when we went, and all the food came at the same time (although there were only two of us!). Thanks for your comment.